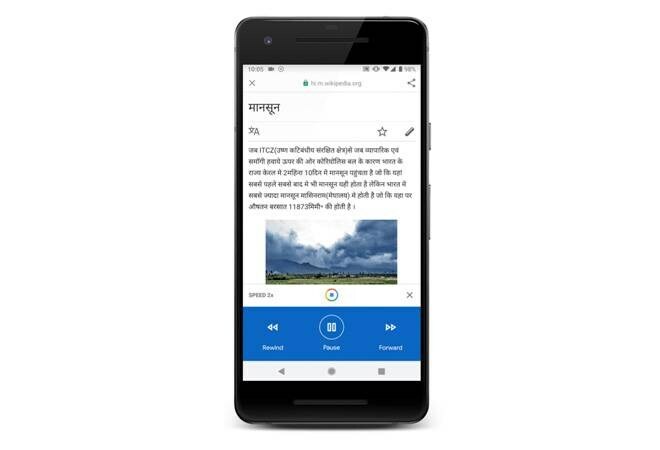 Announced during the fourth edition of 'Google for India' keynote at New Delhi, this new feature is accessible in 28 languages including English, Hindi, Bengali, Marathi. Last year, Google introduced Google Go, a tailor-made app for Google Search for India. Making it easy for users to consume information, Google has now launched a new feature that reads our web pages out loud, while highlighting the text word-by-word in real-time. Announced during the fourth edition of 'Google for India' keynote at New Delhi, this new feature is accessible in 28 languages including English, Hindi, Bengali, Marathi, Malayalam, and Tamil, and will be available in all countries where Google Go has been launched. Shashidhar Thakur, VP, Engineering, Google Search, says, "For Search to be truly helpful, it should bring you useful content, in all the languages you understand." He further states that this new feature is inspired by user research in India. Google heard from people how important it is to understand information effortlessly. Especially for people coming online for the first time, consuming long-form text on a small device can be difficult and time-consuming. With this new feature, users can just press play and follow along. Google uses artificial intelligence to detect and read the most important information on a webpage in a natural-sounding voice. Using natural language processing and speech synthesis AI, this technology can read billions of web pages in 28 languages. AI also helps determine which parts of a page to read and which to leave out. This can come in handy for those learning new languages. It even works on 2G connections and does not consume much data. "The first internet users in India consumed English-language content on their PCs, and later, their high-end smartphones. Today, however, there is a generation of internet users with completely different needs - where their first and only internet experience is via a touch-screen and not a keyboard. We have a responsibility to make sure that our products work well for every one of these users. Many of India's new internet users favour listening and speaking over reading text. That's why we're launching a new feature in Google Go that lets you listen to web pages," says Rajan Anandan, vice president, India and Southeast Asia. This new feature can enhance multitasking. For instance, when following a recipe while cooking a meal or catching up with news on a commute, one does not have to look into the phone to read the long-form text. Just by hitting the play button, the app will start reading the text and will highlight the spoken words in real time. Google says that this tool can also helpful for people who may have visual or reading impairments, or those less comfortable reading long texts. The Mountain View tech giant has been focusing on vernacular languages and has launched a Navalekha Project for registered language publishers to publish their content online. Even the Google Feed gets bilingual support for English and Hindi and will arrive on Google Go in coming months.